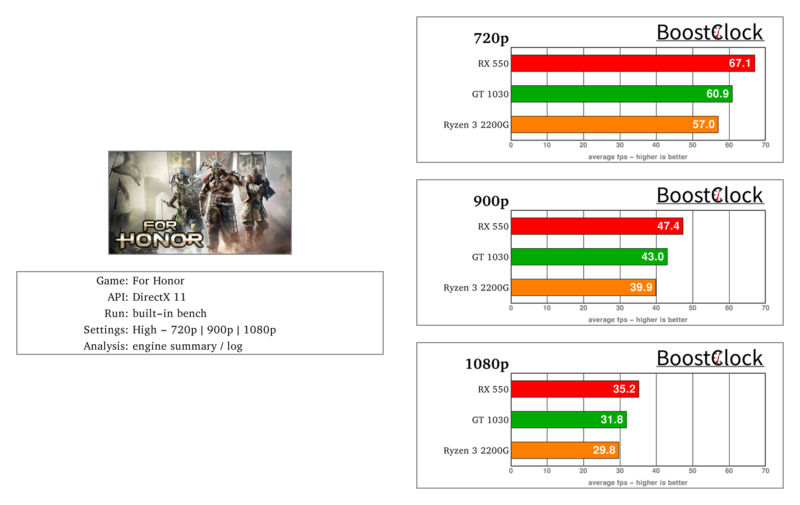 Let's analyse the performance of the recently released Ryzen 3 2200G with the help of 5 Ubisoft titles running the games' built-in benchmark. Compared to entry level dGPUs AMD 15h-gen (Bulldozer microarchitecture) APUs like the A10-7860K performed much better in lower resolutions relative to 1080p, mainly because of the limited DDR3 bandwidth. The results below suggest that Raven Ridge paired with high frequency DDR4 RAM no longer suffers from this effect. All games were tested in 720p / 900p / 1080p with the very same settings. Went for graphics settings that are playable and looked decent - modern AAA titles look very dull w/o AO and shadows. Great benchmark with little to no variance in scores on the same system (every test was run 3 times). Vega 8 scored just shy of the GT 1030. Developers really should ship these type of games with a little editor so one could set up camera flythroughs - content creators would be all over it. Consistent runs on all configurations with RX 550 leading the pack. It's a pity that the bland built-in benchmark doesn't depict the awesome warriors and locations of the actual game. AMD graphics solutions overpower the GT 1030 in R6S. The results are very close to each other in GRW's built-in benchmark. The RX 550 came out on top average-wise, but the GT 1030 had considerably better minimum frame times (data not shown). As a side note: the Ryzen 3 2200G crashes the application just before the results page would show up. The game creates the log file, but with missing data - GRW can't read GPU utilization, temperatures of Vega 8 and game settings are not logged either. The DX12 path of the Snowdrop engine can push AMD hardware in lower resolutions. The budget NVIDIA dGPU scores the same results on both APIs.